Seeing official release next week, Leslie Feist's long-awaited new album Metals, having been teased through a short, documentary-style video in the last two months, is now available in a free stream form. Other than entering your email address, with the extra gift of getting emails from indie-rock-goddess-wondercrush Leslie Feist, we are also treated to another year-alteringly exceptional album. Metals finds a strong and mature spot between the more spare Let It Die and 2007's breakout, pop-strong The Reminder, and Feist feels more confident than ever to concoct sprawling, orchestral soundscapes that both dazzle and frighten. This is another case, as with Bon Iver and St. Vincent earlier this year, where an artist comes to us in 2011 with a new release that offers a sort of climactic magic that both reinvents and summarizes their entire catalog. 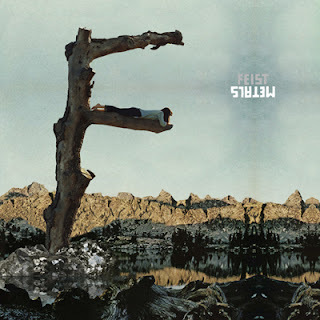 Metals isn't so different from anything you've heard before either, and like the artists I've just mentioned, Feist delivers on her central promise. You will receive great lyrics, beautiful vocals, big, emotional material, and moments of overwhelming rock... plus, now more than ever before, there's a healthy dose of experimentation. Opening with the duet-ish "The Bad in Each Other," Feist seems ready to continue the romantic dialogue she has started so long ago. It's a sincere and tender song, but one that also has a sturdy, somewhat grungy structure. "Graveyard," though, implies a sort of drive for reinvention and invigoration. The refain, "Bring them all back to life" that closes the track is energizing and a little creepy. This is a pop song at the strangest extreme, not quite as grungy and complicated as St. Vincent's work, but still theatrical. And that's really the word for the whole album. Metals is theatrical. The beautiful, jazzy, and mournful "Caught a Long Wind" follows. It's like classic Feist. Rather, it is classic Feist, but later in the timeline. "How Come You Never Go There" is likely one of the first songs from the album that will catch fire in the mainstream. It has a swagger and bounding nature that's both sultry and direct. Of course, "A Commotion" will be up there too, with it's nearly Fiery Furnaces-style mashing of keys and driving drums. Feist's syncopated vocals and the barked, all-male chorus, will stick this song in your head. Then comes "The Circle Married the Line," which beautifully paints a lovelorn story of the kind we are used to from Feist. It is nearly a showtune, but there's enough darkness mixed in with the hope and nursery rhyme aspects that it will never be confused. "Bittersweet Melodies" opens with a subtle background drone... cymbals and guitar feedback. Then Feist comes cooing in. It's a beautiful song, sweet and chirpy, but still there's an underlying sadness throughout. The jazzy and gorgeous "Anti-Pioneer" is all sliding and twanging guitars mixed with a subtle back beat that almost screams out. Layers of vocals give parts of the song a muddled, complicated quality, too. It's a beautiful tapestry of a song. "Undiscovered First" has some of the most rocking and chaotic instrumentation on the album. It's one of my favorites, possibly the best track on the album. The beautiful, folksy "Cicadas and Gulls" offers up the intimate kind of Feist we loved from Let It Die. And the penultimate track "Comfort Me" is one of the most gorgeous songs of all time, with rattling guitar and vulnerable lyrics. And it may be the best track on the album too. It's something here because Metals builds steam and gets better as it goes. It grows more vibrant and aggressive, leaving the early calm quiet behind. The closer, "Get It Wrong, Get It Right" is just insanely, perfectly, immensely beautiful. Like the driftwood-built "F" on the album cover, Metals is both sturdy and vulnerable. It is a structure that can hold itself up, but also one that needs only a great wind or fire to muddle the works. It is representative of life, but itself not alive. And that speaks to the cool opening, and hefty beats that populate the record. Get Metals when it comes out on October 4th. And listen to it before hand through Feist's website, www.listentofeist.com. Dig that jazz sultry sound Feist. Ever hear the mix she did with K-OS for Mushaboom, it's pretty darn good...yup. Josie Charlwood covers "Feel Good Inc."